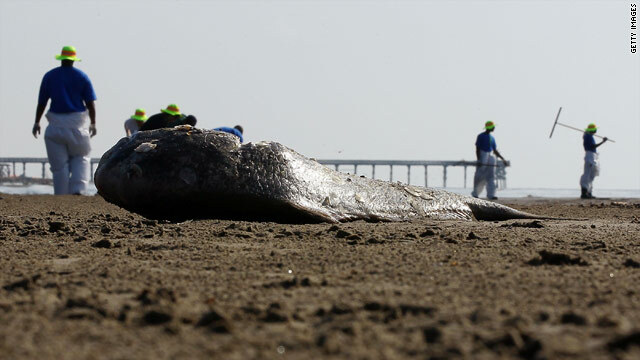 Workers contracted by BP clean oil from the beach in Louisiana. (CNN) -- Stress combined with heat and exposure to chemicals could be among the factors that sent seven Gulf fishermen who were helping with oil cleanup to the hospital Wednesday, experts say. "The work is likely not your traditional eight hours' work," said Matthew Nonnenmann, an assistant professor in occupational and environmental health science at the University of Texas Health Science Center at Tyler. "They're out there trying to contain the oil and protect homes and livelihood. It's not a typical scenario." The cleanup workers' complaints of dizziness, nausea and headaches prompted authorities to pull all vessels off the water Wednesday. Seven people were admitted into a Louisiana hospital after complaining of severe headaches. All remained hospitalized Thursday afternoon. "It's difficult with things like that to know what exactly is the cause," said Dr. LuAnn White, professor and director of the Tulane Center for Applied Environmental Public Health in New Orleans, Louisiana. It's possible to become sickened if volatile compounds still remain in the oil, she said. If a worker has direct contact with concentrated dispersants -- chemicals intended to break up the oil -- before they're mixed into the water, that could affect their health. Several scientists and the U.S. Environmental Protection Agency have raised concerns about BP's use of dispersants. The agency instructed BP to scale back its use of dispersants and to seek an alternative to the hundreds of thousands of gallons of Corexit 9500 that have been sprayed since April. The product has been rated less effective and more toxic than many others on the list of 18 EPA-approved dispersants, according to testimony in a congressional hearing last week. Video: Sickened by the oil? Prolonged contact to dispersants can cause skin, eye and respiratory irritation and vomiting (if ingested), according to the Centers for Disease Control and Prevention. The EPA has also been monitoring the air and water for dangerous levels. U.S. Rep. Charlie Melancon, D-Louisiana, has requested that the federal government set up temporary health care centers along the Gulf Coast to serve volunteers and workers. For most people, brief contact with small amounts of light crude oil and oil spill dispersants will do no harm, according to the Department of Human and Health Services. People who are not working in the cleanup efforts and are not in direct contact with chemicals probably will not have health effects, said Dr. Debra Cherry, an assistant professor at the University of Texas Health Science Center who specializes in environmental health. "The exposure to people living near the beach will be minimal unless there is oil burning on the beach," she said. "If there's oil visible on the beach and you live 100 yards away, that's not really adequate exposure to cause any expected health effects." The odor from the chemicals is below the level that can make people sick, according to the Department of Health and Human Services. For those who have had direct contact with the chemicals, the long-term health effects are difficult to gauge. "The compounds may be carcinogenic, and you might see an increase in cancer incidence," Cherry said. "It'll be difficult to evaluate or attribute to any particular exposure." Years after the Alaska's 1989 Exxon Valdez spill, clean-up workers reported illnesses such as liver problems, asthma, pancreatic cancer, emphysema and oil on the lungs, according to claims filed with the U.S. Occupational Safety and Health Administration. The most immediate effects might be the stress from the loss of jobs and income in the Gulf fishing industry. "Anxiety, concern, loss of everything, that's what those fishermen are going through -- the loss of their everyday life," White said of a community that was devastated by Hurricane Katrina in 2005. "If we are looking at long-term health effects, it's going to be anxiety and stress that effects the people at the mouth of the river: the fear of the oil, the economic impact." This loss of an industry and jobs could fuel depression, alcohol abuse, domestic and family problems, said Dr. Howard Osofsky, chairman of the department of psychiatry at Louisiana State University Health Science Centers. Fishing families are worried, because many of them recently took second mortgages to buy refrigeration equipment to meet new fishing requirements. Unlike Hurricane Katrina, where people were able to rebuild their homes, the oil spill is a different situation for some multigenerational fishing families, Osofsky said. "This is different type of disaster, where people may not be able to rebuild," he said. "You can't rebuild the ecology or environment. People whose lives centered on fishing may not be able to rebuild that. Hopefully, they can." CNN's Danielle Dellorto and Wire staff contributed to this report.